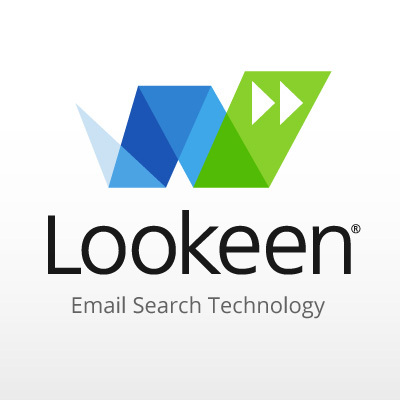 Search Outlook with Lookeen - Best email search solution available! 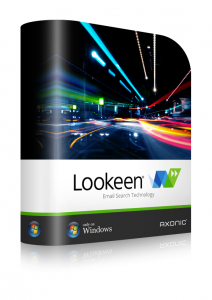 Search Outlook with Lookeen – Best email search solution available! 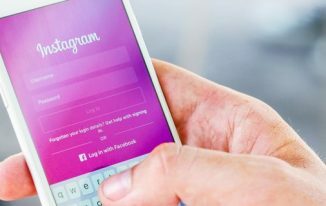 If you do anything on the internet, you already know that having an email account opens a lot of doors and allows you to make accounts on sites that are useful to you. Also, having an email helps you to communicate personally & professionally and it is one of the earliest forms of web communication in the world. To this date, nothing has been introduced that can replace email totally. But there are products that complement the experience of managing, sending and receiving emails. Lookeen is one such tool that works along with Microsoft Outlook and it is the best outlook search tool as of now. Not only outlook search but it has desktop search and public folder search as well. To be honest, the native search feature of Outlook is not at all great and it would be frustrating to do instant search in Outlook. So, if you deal with critical emails, hundreds of contacts and have to consider more appointments, Lookeen is the perfect tool for you. Let’s discuss the key details of this Outlook search product through this post. I am specifically using the phrase best email search for a reason here. 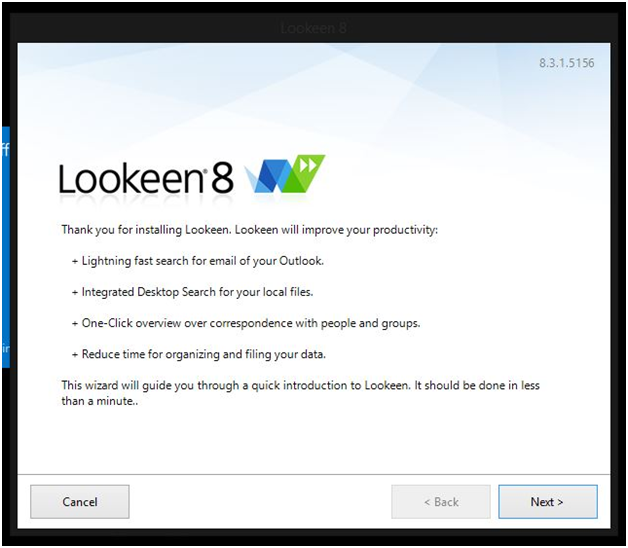 Basically Lookeen is an extension to Microsoft Outlook that makes searching through outlook pretty easy. Through the real-time index of Lookeen, you can search mail, calendar, contacts, tasks, etc. and also your desktop items in a much better way as compared to the native Outlook search. Lookeen can be downloaded from here and the set up file is quite small as well. 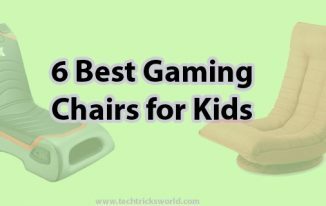 Let’s see how to set up Lookeen on your PC. After you have downloaded Lookeen, the wizard will walk you through the installation wizard which is easy to follow. 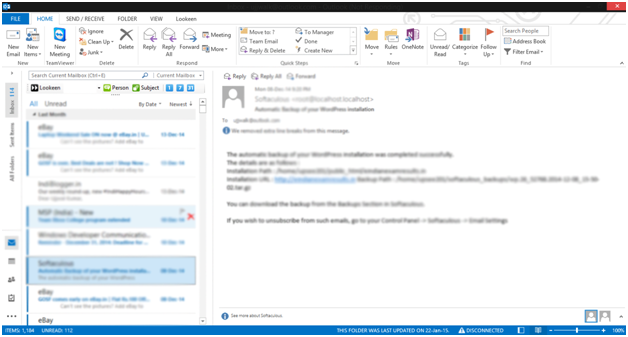 After setting up, when you run Lookeen for the first time, you will be asked to set up your Microsoft Outlook client by giving your outlook email and password. After you have set up your account, you should see the window as shown in the image below. Just follow the wizard and set it up. The first index by Lookeen takes some time but once this is complete, the future indexes will be done in real-time. Now, we know what Lookeen is and what it can do. So, we can take a look on how it works and why it is being called the best email search solution after all. I am using Microsoft Office 2013 here in this review so you can see that we have a different tab after installing Lookeen. Clicking that tab reveals the entire Lookeen stuff available and you can use it to search through your emails easily. It will be an instant search as Lookeen has already indexed your emails and knows what’s inside, so when you search with a string, you will be getting instantaneous results. In the following example, I have searched for the word “PayPal” and it right away showed me the results and mails containing this keyword. You also have functionality of searching through Outlook by refining your search by dates, attachments or even through preferred names. Not only these, it has ability of searching through multiple .pst files which also counts in mails which include attachments. Since all these mails are indexed already, the searching is quite fast and definitely better than the native outlook search. Apart from indexing emails, it also indexes every other Outlook item that includes emails, calendar, contacts, tasks, appointments and everything that is a part of Outlook. So you can use Lookeen even if you have a PC that runs Windows XP and up to all versions until Windows 8.1. The supported versions of Microsoft Office packages are 2003, 2007, 2010 and 2013. In addition, you need to run Microsoft .Net Framework 3.5 and above to properly run Lookeen. I’d like to sum up the best features of Lookeen now! Lookeen can be called as Reliable data search tool as it can index and search the files in My Documents and other locations (You can add) in addition to your Outlook data. Clean, simple but powerful interface of Lookeen would let you to search large & multiple .pst files. With this highly customizable tool, you can choose to index any type of folders on your system like shared folders, network folders etc. 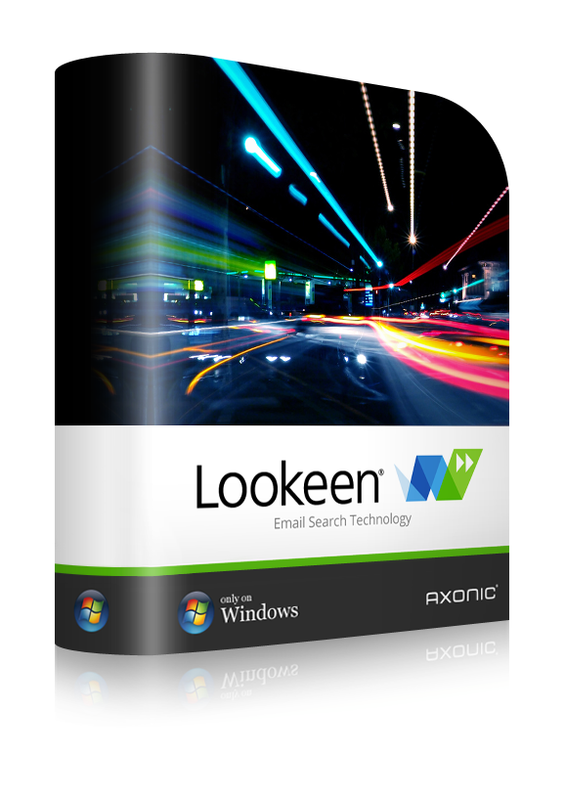 Now I am sure about this that Lookeen is the best email search solution available for Outlook till date but it comes at a price and not free to use. You can get a 2 weeks i.e. 14 days trial before you decide to buy Lookeen. You might feel that the prices are a bit high but by paying these prices would make you to feel comfortable with all your works related to emails. Lookeen is amazing at what it does and I hope the prices do come down a bit soon and that would make it an amazing deal for the purpose it is coded for. If you’re a business owner/manager who handles plenty of mails daily, then you may use this top email search solution tool to find out the busiest time of the day for email communication and plan resources accordingly. As Lookeen gives the required information quickly and without difficulty, you can customize what and how often to index your Outlook data. Moreover, you can increase your productivity through its Analytics and Global Search features. 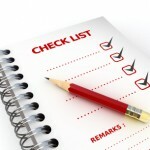 So, you got the details of the best email search tool, Lookeen, isn’t it? What do you think about this vibrant Outlook add-in? Share your views in comment section. 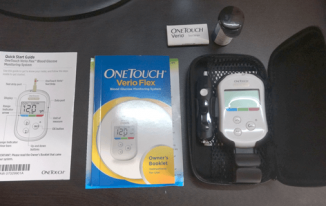 Having this kind of software could prove to be extremely useful. I have to deal with tons of emails, so yeah, thanks for writing an in-depth explanation of all that it can do! I have my own business and it is related to Internet, most of the client are from the foreign they always send me bulk of email, your blog on the email handling software is really useful for me.